A publicity image released by Car hints at a future expansion of Audi’s RS line of performance cars. Next to the upcoming RS5 Cabriolet are three new models. One is most likely the RS6 Avant station wagon, while the other two are brand new. For car fans, RS is code for fast. It marks Audi’s high performance models, built by the company’s Quattro skunkworks. They’re the equivalent of BMW’s M and Mercedes-Benz’s AMG models. Luckily, each car has a very distinct shape, making an educated guess possible. The wagon-shaped lump next to the RS5 Cabriolet is most likely the RS6 Avant, which was revealed last week. Under the hood is a twin-turbocharged 4.0-liter V8, with 552 horsepower. It can do 0 to 62 mph (0 to 100 kph) in 3.9 seconds and follows Audi’s tradition of building sport wagons instead of sport sedans. The real mystery lies under the other two sheets. The car to the left of the RS6 Avant is about the same size, but has a curvier roofline. That means it could be an RS7, a souped-up version of the A7/S7 “four-door coupe.” Since the A6 and A7 are essentially the same car, it would be very easy to fill the A7 with RS hardware. In theory, a production RS7 would have the same 552 hp V8, upgraded suspension, and racy body kit as the RS6 Avant. In fact, the current S7 uses the same V8 as the RS6, albeit detuned to 420 hp. The third car is a bit more puzzling. It’s definitely a crossover, which would make it the first such model to get the RS treatment. It looks a little too small to be a Q7, which leaves the Q3 and Q5. Audi showed an RS Q3 concept at the Beijing Motor Show last spring, so the fourth new RS model could be a production version of that. The concept had the TT RS’ 2.5-liter inline five, which produces 360 hp. At the time, Audi said the RS Q3 would do 0 to 60 mph in 5.2 seconds. Audi would have to bring the regular Q3 to the U.S. before importing the RS Q3, and right now it seems focused on selling Americans the softer SQ5, which will have a 3.0-liter, 354 hp, supercharged six. No matter who gets to buy these models, they will mark a major expansion of the RS line. With only three RS models currently on sale (RS4 Avant, RS5 Coupe, TT RS), the number will more than double in the coming year. 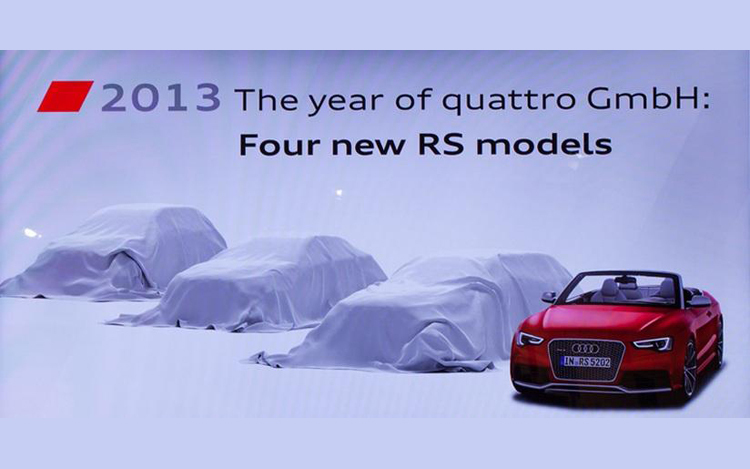 Expect the new RS models to be unveiled at auto shows throughout 2013.